Well, here it is… the very first installment of our Cairns Unlimited ‘Daily Blog’. It’s been a very, very, very long road since the conception of Cairns Unlimited almost eighteen months ago, and there have been many frustrations and obstacles along the way, but I am delighted to inform you that we are finally reporting to you from Tropical North Queensland! I guess the most polite way to start would be to introduce ourselves. My name is Steve Savage. 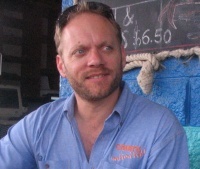 I’m a Queensland boy from birth, but caught the travel bug from a fairly young age and have spent a great chunk of my adult life exploring the world, from West Africa to the Middle East, much of Western and Eastern Europe, a number of Asian countries, and a lot of time in North America and the UK. Cairns Unlimited receives its feminine touches from the other half of the team, Maria Marcelo. Maria is a Spaniard; a hot blooded Madrilena. We met in Madrid almost three years ago, and she hasn’t been able to get rid of me ever since. We visited Tropical North Queensland together eighteen months ago, and had no sooner boarded the plane back to Spain than we started planning a way to return to this beautiful part of the world… but not just for a visit this time! We arrived back in Australia just over two weeks ago, and have spent that time catching up with friends and family, buying a van, and making contact with North Queensland businesses. Our trusty Toyota Hiace van has covered almost 4,000 kilometres already, and hasn’t missed a beat. Today was our longest drive yet; 12 hours from Mundubbera in the state’s south to beautiful AIRLIE BEACH, just an hour or so above the Tropic of Capricorn. 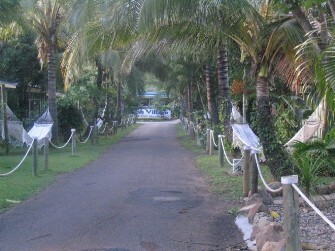 I have fond (but slightly cloudy) memories of Airlie Beach from a visit ten years ago. Maria hasn’t been here before; in fact everything from here on in - with the exception of the short stretch from CAIRNS to CAPE TRIBULATION - will be new territory for her. So stay tuned for some possibly surprising revelations about Tropical North Queensland from an outsider’s point of view when Maria takes her turn at our Daily Blog. Where was I? Oh yes, Airlie Beach. We wheeled into town at about 6:00pm and couldn’t pass by Bush Village Backpackers Hostel, just before Airlie Beach township. This is where I stayed all those years ago, and I wasn’t really surprised to find the same friendly face behind the reception desk. Greg has been the manager here for fourteen years, and the ownership is still the same as well. Ironically, the owner, Ken, is in Spain at the moment. At first glance, the place hasn’t changed much. But when Greg swung open the door to our private studio cabin in the tropical gardens, I had to admit that this isn’t the same Bush Village Backpackers I had stayed at in my younger, wilder days. 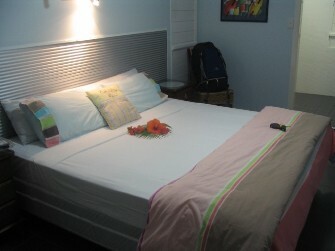 Once inside the studio, you could be forgiven for forgetting that this is actually a backpackers hostel. It has obviously been recently renovated, and is neat as a pin, and immaculately clean. At around 32 square metres, it’s almost as big as the apartment Maria and I shared in Madrid, and here’s something we never had in Madrid … fresh tropical flowers on the bed, and in the bathroom! On the subject of the bathroom… if I told you that the shower is large enough to fit a whole Swedish netball team, would you take my word for it, or would you want to know how I could be sure? Maria and I dropped our luggage in the cabin and headed into town for dinner. Airlie Beach was uncharacteristically quiet, although a couple of the hostels along the main street seemed to have attracted decent crowds. The town’s dining choices have doubled since my last visit, but unfortunately so have most of the prices. Airlie Beach is definitely not some scruffy backpacker destination, and many of the old fashioned burger bars and fish and chip shops have been replaced by upmarket seafood restaurants and trendy eateries of every imaginable style. Maria and I ended up settling on a couple of bowls of noodles from a noodle bar, which was a welcome change from the ‘roadtrip food’ we’ve been subsisting on recently. A word of warning. Restaurant kitchens tend to close early here. In fact, a couple of establishments were in the process of mopping up while we were still making our minds up… and that was only 7:30. If you were to go in search of a restaurant after 9:00pm - as is the Spanish custom - your options would likely be severly limited. But we’re back in our comfortable cabin now, and are discussing our plan of action for tomorrow. Tomorrow is our first full day in Tropical North Queensland, and our first day on the campaign trail, so to speak. On with our newly embroidered uniform shirts, out with our glossy business cards and our gleaming smiles, ready to hit the pavement and meet as many local businesspeople as possible and spread the word about Cairns Unlimited before it’s time to venture a little further north. This entry was posted on Wednesday, May 30th, 2007 at 2:39 pm	and is filed under Road Trip. You can follow any responses to this entry through the RSS 2.0 feed. You can leave a response, or trackback from your own site. I just ⅽould not go away your website prior to suggesting that I really loved the usual info an individual provide on your guests?